Please note that the new Rules of Golf have taken effect since 1 Jan 2019. Following the recent changes, the local rules for golfing at Marina Bay Golf Course have also been updated. For more information, please visit links below to learn more. The ball must be dropped straight down from knee height. • “Knee height” means the height of your knee when in a standing position. • You do not need to be standing when the ball is dropped. • A drop does not count if the ball touches you or your equipment before hitting the ground. • A drop does count if the ball accidentally hits you or equipment after it has already hit the ground. First strikes the ground in the relief area, AND THEN comes to rest in the relief area. Your ball will be lost if you do not find it within 3 minutes (rather than the current 5 minutes). You will be allowed to repair almost any damage to the green, including spike marks and animal damage. You will be allowed to hit the unattended flagstick in the hole when putting. The club to be used for measuring purposes in all relief situations is the longest club in your bag, other than your putter. 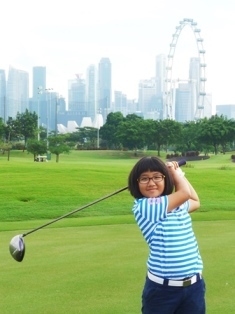 my golf kaki is proud to announce that our junior golf ambassador, Angel Lim, has been recently promoted to the Singapore Golf Association (SGA) Development Squad. Angel started out in the National Junior Squad and performed exceptionally well last year. She recently emerged champion for her age division in the 6th Pondok Indah International Golf Championship in Indonesia, sweeping the competition away with a 12-stroke lead. Her budding skills coupled with her golf acumen and an open mindset made Angel a front-runner to progress to the Development Squad. The Development Squad will serve as training ground before golfers can progress to the Elite Squad, which will consist of the top amateur golfers in the country. This is a great platform for Angel to cultivate her game as she will be given more opportunities to be exposed to a higher level of training and competition. Our heartiest congratulations to Angel and we wish her all the best! A my golf kaki member since she was seven, Angel's steely-eyed determination and razor-sharp focus even during practice belief her tender age. Get updated on our latest promotions this issue and learn more about Goy Soong Ngee, our Member of the Month and a dedicated golfer! Click on the image to view the full newsletter. Scroll down to view more issues. Please note that with the implementation of the new Centralised Handicapping System (CHS), registered golfers will be able to submit scores and perform all their handicapping activities via multiple channels. Hence, please be informed that the my golf kaki score card box at Orchid Country Club will be removed with effect from 26 July 2016. For the full announcement, please refer below. The Singapore Golf Association (SGA) will be launching the Centralised Handicapping System (CHS) on 4 August. The CHS will replace the current handicapping system, providing a modern and unified platform for golf handicapping, changing the way golfers perform their handicapping activities, and introducing consistency in the calculation of golfers’ Handicap Index. CHS also tracks golfers who play at any golf course in Singapore and requires that a score be posted in order for golfers to avoid being awarded a penalty score. For more information, please visit SGA Centralised Handicapping System. You will be receiving a letter from my golf kaki stating your Handicap Membership Number and more information about the registration for the Centralised Handicapping System. Please DO NOT key in your NRIC number as membership number. Please click here for a step-by-step guide to the Online Registration for CHS. Once you have activated your account, you will be allowed to log in and view your Handicap Index, enter scores and enjoy the new system. If you do not have an email account, please drop by the my golf kaki office for registration assistance by 25 July. However, please note that offline submission of scores will require at least ten (10) working days’ lead time. my golf kaki will not be liable for possible penalty imposed due to late submission of scores. Scores can be posted anywhere and anytime either by the clubs or individually by golfers via the Internet or through a phone application (iOS or Android). Players who did not register for CHS will not have a valid USGA Handicap Index as their handicap records will be removed from the system. Also, they will not be eligible to participate in tournaments that require a Handicap Index once they have opted out of the CHS. The Club can issue you an introduction card that will reflect your status as a Social Member who no longer maintains a competitive handicap. The card will also include your last Handicap Index and it is valid for golf games at Marina Bay Golf Course and Orchid Country Club. It is at the discretion of the other golf clubs to allow you to play. Please email contact@mygolfkaki.com should you choose to opt out and would like to request for an introduction card. Please do not submit scores from 26 July to 3 August as it is the blackout period for system migration. Please keep your score cards and update the scores from 4 August onwards. Please refer to SGA website for a list of frequently asked questions and SGA Personal Data Protection Policy. Should you require any further clarification, please contact my golf kaki at 6342 5736 /6342 4557 email to contact@mygolfkaki.com. 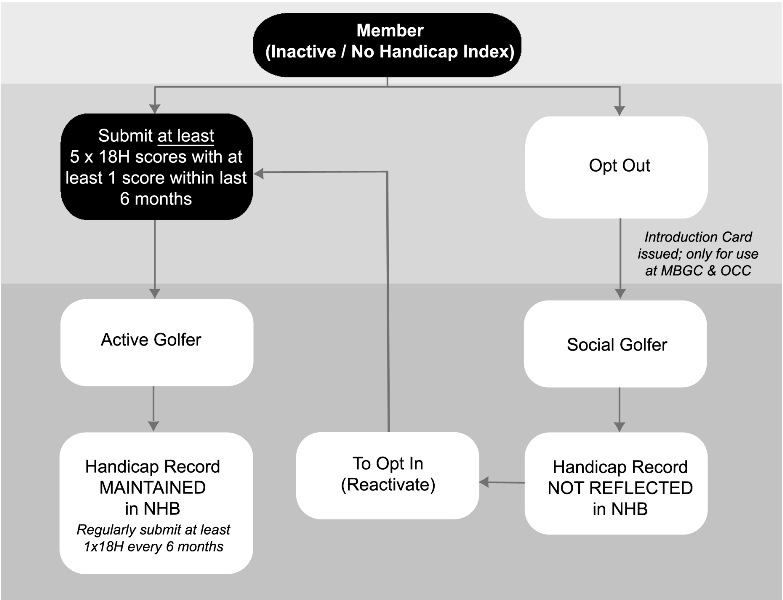 Members maintaining a handicap index with the Club are reminded that to be issued a USGA Handicap Index, golfers must conform to the USGA Handicap System 2012-2016 and the SGA Handicap Policy. A player should post a score immediately after the round or as soon as practical; this can be an adjusted hole by hole score or just a gross score. If you have arranged for a handicap transfer to the Club or have recently completed your Courtesy Round, please submit up to five 18-hole games or ten 9–hole games to obtain a Handicap Index. Please ensure at least one score is dated within the last 6 months (ie gap between date of plays not more than 6 months). You may choose to opt out should you not wish to continue to hold a USGA Handicap Index. Kindly be reminded that should you opt out, you are not required to post scores and meet any other handicap compliance requirements. Players who have opted out will have their handicap records removed from the Ordinary Member’s handicap register and the SGA National Handicap Book. The records will be kept in another database throughout the membership term in case activation is required. Also, you will not be eligible to participate in tournaments that require a Handicap Index once you have opted out of the Handicap System. The Club can issue you an introduction card that will reflect your status as a Social Member who no longer maintains a competitive handicap. The card will also include your last Handicap Index and it is valid for golf games at Marina Bay Golf Course and Orchid Country Club. It is at the discretion of the other golf clubs to allow you to play. Please email contact@mygolfkaki.com should you choose to opt out and would like to request for an introduction card. Retain your my golf kaki membership continuously and enjoy added perks. The longer your membership, the more benefits you get! Please refer to the table below or click here for more information. * Perks applicable at Marina Bay Golf Course only and subject to availability.